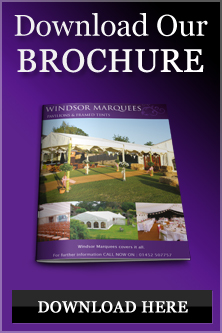 Windsor Marquees have be supplying marquees in Tewkesbury and the surrounding villages for many years. With our base located only 4 miles from the town centre giving us easy access to service the town and surrounding villages. Priding ourselves on personal service, care and attention to detail. We aim to make your event a perfect and successful event. We specialise in hiring marquees and accessories with our dedicated staff to ensure you can relax and enjoy your day, whatever the occasion within Tewkesbury and its surroundings. We can provide marquees for all types of events whether it is for a small celebration catering for twenty or a large wedding or corporate event for 500 arranging this can be very daunting task. Using all our own equipment allows us to keep our costs within an affordable budget while keeping standards to highest quality. Otherwise, we can also help with suggestions for suppliers for such things as toilets, power supply, fireworks, caterers, etc. This charming market town of Tewkesbury in Gloucestershire is situated within 2 miles of the M5 motorway. Tewkesbury is on the banks of the River Avon and River Severn where they both meet .Tewkesbury marina is set on the banks of the River Avon in the beautiful Gloucestershire countryside with easy access to the River Severn, The marina, with its extensive facilities including 400 flood protected moorings offers a safe berth for family and friends to enjoy life afloat in a friendly and relaxed environment. The battle of Tewkesbury took place on May 4th 1471 between the houses of York, The White Rose, and Lancaster, The Red Rose and was the final battle of the Wars of the Roses. It started because Henry VI was considered insane and the country was without a strong leader. Edward of York, the most able leader left, was declared King in 1461. He had Henry locked in the tower of London and his wife Margaret of Anjou fled to France with their son also called Edward. When he reached 18 she decided to return to England and re-claim the throne for him. She landed at Weymouth on April 14, 1471, and set off for Wales, where Jasper Tudor awaited with re-enforcements for her small army. Gathering supporters as they went, they headed for Gloucester to cross the Severn, only to find the city locked against them, by King Edward’s orders. They headed for the next crossing point, Tewkesbury, but found that Edward’s army was so close behind they had to stand and fight, rather than cross. Exhausted and outnumbered they were easily defeated, and so many of them were slain trying to get to the river that the field they ran through is still known today as Bloody Meadow. This is a great weekend and should not be missed ! The Roses theatre offers audiences the opportunity to experience an exciting range of live shows and film screenings. The 370 seat auditorium is home to a diverse range of shows – from big name comedy, gripping drama, innovative dance, stunning opera, authentic tribute bands and so much more in between The theatre’s impressive film programme features an engaging mix of art-house films which jostle for space alongside the current blockbusters and Oscar winners. The Roses is also the best place in Gloucestershire to experience the wonderful live screenings from the National Theatre and the Met Opera.